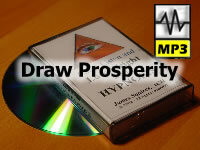 Draw Prosperity!...perceive a new focus in your life..a new clarity of purpose.. For your magical source is now energizing and deeply instilling you with your true aspiration - to finally actualize your life's potential! Neuro-Linguistic-Programming has been demonstrated in numerous psychological studies to provide effective techniques both for inducing positive emotional states - and also for replacing self-defeating behavior patterns with more attractive and life-enhancing alternatives. Simply relax and listen to the audio program story on a regular basis. Click here for complete details - save shipping time and money with MP3 Instant Download. Please note: As digital products can be easily duplicated we offer no refunds or returns on this item. MP3 files are very large (20+ MB) and may require a long time to download on slower connections. Not for Resale. � HypnosisOnline.com All rights reserved. Design & Hosting by TeleSites.net - Set your sites here!